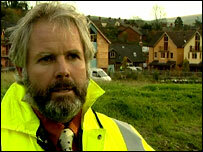 A developer in Shropshire is building one of the greenest and most neighbourly housing schemes in the country, Ben Geoghegan dropped by for a visit. The Kings say the Wintles has "a tremendous sense of community"
The buildings are scattered in a higgledy-piggledy layout around a small village green. From one of the chimneys, a long, thin snake of smoke winds its way into the sky - a signal people actually live in these fairy-tale dwellings. This is the Wintles, a new development of 40 houses on the edge of the town of Bishop's Castle in the Shropshire hills. These are some of the greenest homes in the country. Despite their make-believe appearance, the buildings are actually designed with some sobering realities in mind: the fact, first of all, that the planet is getting warmer. The fact that our homes make up around 27% of the UK's carbon emissions; and the target set by the government of reducing our carbon output by 60% by the year 2050. Bob Tomlinson is the man who came up with blueprint for the Wintles. But Bob is not a builder. He was working as a freelance film-maker when he saw an opportunity to design homes which where energy efficient but which didn't force people to compromise on style. Above all, he insists, the Wintles is a modern development: "We set out to build houses appropriate for the time in which we live. "We felt most builders now are using designs from the 1970s and so we looked at what was happening in N America and Scandinavia, brought it all together and came up with a very light and environmentally efficient house. "If we were building cars we would set out to build an energy efficient stylish smart car." As warm sunlight streams in through a 20 feet tall window, he explains that this building - one of the first to be finished - hardly needs any central heating at all. "It has air tight doors and windows. It has triple-glazed windows where there is glass and that means the heat that is generated within the building is contained or generated by the solar aspects of the glazing is contained within the house." These houses also reduce what's known as embodied energy, the actual energy cost of putting up the buildings in the first place. The production of concrete, for example, is energy intensive and polluting. The Wintles homes have reclaimed tiles and bricks which are bought locally. They use lime rather than concrete to render the walls. Pipes and guttering are made of recyclable copper. The lifestyle of the residents has been engineered with the same attention to detail as the houses themselves. This is not just about creating green buildings. It's also about getting people who live there to interact so that they generate a strong, sustainable community. The houses all face each other with open porches so people can see their neighbours. 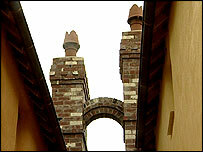 The builders have added connecting arches and dry-stone walls to create symbolic as well as physical links between the houses. It's a direct response to some of the forces which have changed Britain over the last 50 years. "People used to live in a more neighbourly way," says Bob Tomlinson, "Pre-war there was a lot more sharing of things like childcare and talking over the garden fence. "Certain things have happened that make it less common and I think it is rather sad. One of things people are interested in this project is the fact it's creating a neighbourhood rather than housing estate." Paul King moved to the Wintles two months ago with his wife and two young children, "There is no question that my family and I met more people in those first few weeks than we did in 8 or 9 years in the last place that we lived in Surrey. "And there is a tremendous sense of community and the layout and the format of these homes means we now do know our neighbours." On the other side of Bishop's Castle, there's a different type of development altogether. The Brick Fields estate is, as its name suggests, a series of neat red-brick plots with a road running through the middle. This is the way we've been building houses for decades, but some architects blame bland developments like this for helping to kill off community life in Britain. Gideon Amos, director of the Town and Country Planning Association says, "Too often we have lost a sense of creating communities and community networks in the places that we create. "We used to be very good at that. In the new towns many were created on ideals of community interaction, setting up social networks and garden cities were about common ownership. "All these social networks were very important and we need to relearn those lessons." Green, friendly, sustainable. The Wintles is an attempt to respond to some of the social and environmental anxieties of our time. It's an experiment which has just begun but it could provide a model for much bigger housing schemes of the future. Ben Geoghegan's report - the second in Newsnight's Picture of Britain series - was screened on Friday, 19 November, 2004. Come on Newsnight, this scheme isn't going to win design awards. The Wintles is exactly the kind of cliché "woolly cardigan" type of sustainable design that looks naff. All that contrived variation of house types makes it look so suburban. Hurray! A developer with soul and vision - congrats to all involved! It seems like a positive step forward. But with the cost and demand involved so high, it seems like there's a long way to go before eco friendly housing becomes a part of all our lives. This sort of innovative development is fantastic. We can argue about the layout of the communities, but the use of the building materials and energy efficiency standards should be the norm in all developments, no matter which end of the property market. We should not be putting a single roof up anymore without solar usage built in at the beginning. Developers are allowed to be too lazy due to the limited development land (on that note it is nice to see a new house building beyond the first floor). I watched the report thinking it was a wonderful idea until I was told the prices - half a million! In a country where most people earn around £19,000! What's the point? 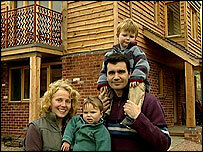 The Wintles is for rich people who would like to pay lip service to sustainability and community spirit. What rural towns and villages need is low-cost housing to keep young people in the community, you don't need to engineer community spirit in places like Bishops Castle , it was here long before Mr Tomlinson arrived. I watched the report thinking it was a wonderful idea until I was told the prices - half a million! In a country where most people earn around £19,000! What's the point? It's just a smug ghetto for the very rich - it has nothing to offer ordinary people because it's quite simply beyond what they can afford. When are these greens going to start building eco-friendly homes real people can afford? I think that the style of housing alone won't encourage the neighbours to interact with each other. What they need is a community centre where they can have meetings every week, so that they have a chance to interact with their neighbours. I think that it is a bit harsh of Paul Teather from Harrogate to simply blame accountants for the usual lack of design and sustainability in modern housing. Accountants merely make decisions to maximise the return to the shareholders. It is the public who need to generate the demand for better housing along with the government setting legal requirements for sustainability. I am an architecture student and my studies constantly refer to sustainable issues in all forms. It's interesting the houses are described as looking like a children's story book, and yet the developer says he hasn't compromised on style! It doesn't appear to be a Brownfield site, of the sort which blights our urban areas. We need an estimated 600,000 new homes in this country, and if they were built on this model, we wouldn't have much countryside left! We need high density structures within our cities which are affordable, while still making use of energy-efficient technology. This combined with upgrading our existing building stock would create a truly sustainable environment. Sounds perfect...but how much do they cost? Is it only the white middle classes who'll be living there? Hope each of the houses has a good eco-friendly double garage! Chris Meighan from Glasgow is worried about how environmentally conscious architects are; the answer in most cases is that they are busy meeting the requirements of the accountants. There is hope; there are over 300 students on the Masters degree of Environmental Architecture at the Centre of Alternative Technology. Crime/poverty etc in inner cities have nothing to do with the way buildings are built - it's the way people act and live in those communities that run it down. They weren't built as slums to start with. Maybe time should be given to educating people to stop using the wall of someone else's property as a toilet etc. I am a recent design graduate and green issues were rarely ever brought up during my studies. Where are the next generation of architects going to learn? It is great but it isn't enough. As your report said, 27% of CO2 in this country comes from where we live. I'd like to see councils refusing planning permission on buildings that don't offer substantial energy saving. We need to get real about the modern energy market. I think this is an excellent idea, but I can't help thinking that these kind of developments will cost more to the buyer, which is why people opt for the cheaper "traditional" style housing. It would be interesting to see a side by side cost comparison between the usual constructional techniques and the more thought out energy efficient homes. We all see TV programme after TV programme encouraging us to conserve energy in the home, but every time I enquire with professional builders, I'm always told the same story, "Oh don't go down the energy saving route it'll cost you more in the long run." I wonder what is the real cost? I love the idea of a more community spirited approach, it just might bring back a few good old values like respect for each other, rather than the "couldn't care less" attitude we all experience today. These houses look lovely but right now I can't even afford to buy a bedsit where I live! Maybe the designers can build some environmentally friendly community friendly flats? Firstly, I think this is marvellous. But such schemes are few and far between in this country. It seems that we need a national (or perhaps even EU-wide) strategy which will force developers to get serious about sustainable development. It starts with education - I am a recent design graduate and green issues were rarely ever brought up during my studies. Where are the next generation of architects going to learn? I feel as though everyone lives in houses which are bolted on to roads which cut through the heart of any potential community spirit. I couldn't tell you who half my neighbours are. Good idea, but 40 houses is hardly going to change the dire living conditions in which so many people have to live due to poverty, crime, drugs etc in our inner cities. About time! I would love to live in a community like this, especially if they have a decent sized plot of land attached, but realistically I think they must cost far more than most of our generation can afford. It would be fantastic to create such houses all over the country. Though expensive initially, money saved through efficiency would reclaim that substantially in the long term. In the meantime, other houses in the UK should be given recycling boxes for glass, plastic, paper and anything else since landfill sites are near breaking point. Prevention is always better than cure. Are there any of these houses left for sale? If so I want to buy one. I feel as though everyone lives in houses which are bolted on to roads which cut through the heart of any potential community spirit. I couldn't tell you who half my neighbours are. Occasionally I catch a glimpse of them jumping in and out of their cars but that's it. I say we stick the roads round the back of the houses and have all the houses facing each other in a neighbourly fashion. Nice, but how does the density compare to traditional housing estates? It looks like it might be about the same, which isn't really good enough in a land-poor country. I would be interested to know how much these homes cost - if they are affordable to all then great idea, if not then it will just be a middle class idyll, nice novelty place and little more. Thank God someone has the courage to break from the vile obsession developers have, in this country, with dated derivative house design. Well done. A fantastic alternative to soulless modern housing estates. I am particularly impressed with environmental aspects, but with the lack of space in the UK is it feasible? As someone who now lives in Scandinavia you really see the difference in building standards and priorities. The UK Government should seriously look at a national plan along the lines of this wonderful development. More of it - when can I move? I applaud the overall concept - not particularly novel, but a hugely refreshing approach to house building. 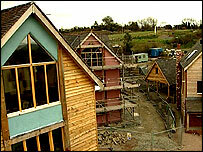 My main concern is the cost of these houses will create something of an exclusive middle class community.